Barker have launched a new Creative Collection of men's brogues for Autumn Winter 2015. 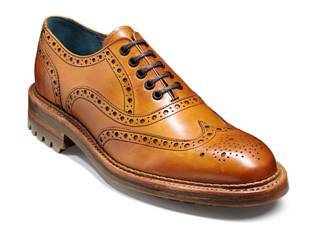 If you are a fan of the traditional brogue look but prefer a shoe that has a little more bulk, then the new Barker Boyd is ideal! The Barker Boyd is perfect Autumn Winter wear, with a 'Commando' sole - giving a chunkier, more pronounced silhouette that is great for wearing with jeans or giving a more casual look to a formal trouser. We have Barker Boyd men's brogues online now in two colour options, cedar calf or cherry calf - both available for immediate dispatch!